Bedford Athletic secured third place in the Midlands One East table with a 12 try 72-10 win at bottom club Spalding. The bonus point victory leaves them six points clear of fourth place and therefore in an unassailable position going into the final round of matches next weekend. The comprehensive win was once again marked by a 1st XV record equalling five tries in a match from Ben Johnson – the third occasion that he has managed the feat this season. 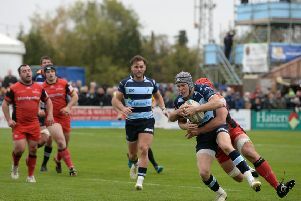 He opened the scoring in this game in the third minute as he sped through the centre of the home defence to score under the posts, with James Mortimer converting. From the next attack the ball ran loose from a visiting hand, allowing Spalding full-back Josh Broome to gather his own kick and score to close the gap to 7-5. However, it was the closest that Spalding got to their visitors all day as a clinical first half performance then saw Bedford continue at in excess of a point a minute. Andy Ince hit back for Athletic in the 11th minute, and Johnson bagged his second try three minutes later, with Mortimer converting. Johnson completed his hat-trick and secured the side’s bonus point in the 18th minute. Luke Levitt crossed for the fifth try in the 23rd minute and Tommy Mills outsprinted the defence for his first try in a hat-trick performance on the half hour. Mortimer’s conversion took the score to 36-5 and, with Johnson adding his fourth try and Mills his second, another Mortimer kick meant that Bedford Athletic led 48-5 at half-time. A converted intercept try from substitute Charlie Reed started the scoring in the second half but the game then meandered through a long period when Athletic dominated the territory but did little with the subsequent possession. Spalding drove over for their second score through Jay Harwood, but Bedford Athletic still finished the stronger side. Ben Reed won a turnover ball from the kick off and Mills once again powered through the defence for his hat-trick on 66 minutes. The best try of the day came from great interplay between Charlie Reed and Johnson down the right wing minutes later, leading to Johnson’s fifth try. The scoring was complete when Charlie Darlow went over in the corner, Mortimer adding the conversion. The season concludes at home to league champions Syston on Saturday.